A BMW sits idle after reports of a shooting in Deerfield Beach involving the rapper XXXTentacion on Monday, June 18, 2018. A suspect in the murder of 20-year-old Jahseh Onfroy, better known as the controversial and chart-topping rapper XXXTentacion (pronounced "ex-ex-ex-ten-tah-see-ohn"), has been arrested, the Broward Sheriff's Office announced this morning. 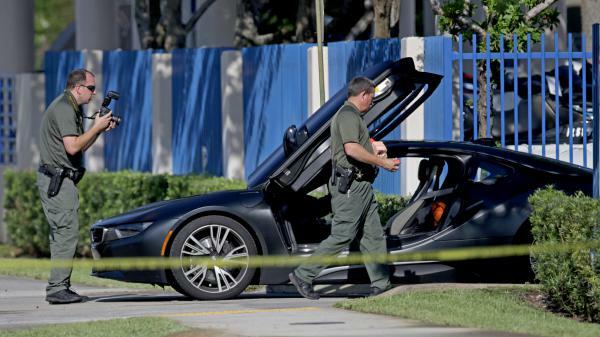 The police say that Dedrick Williams, 22 years old, was arrested for the the murder of Onfroy, who was shot outside of a high-end motor sports dealership in Deerfield Beach, Fla. on June 18. Williams was arrested around 7 p.m. on Wednesday in Pompano Beach, Fla., just south of Deerfield Beach, according to police. In a follow-up statement, police say Williams was arrested during a traffic stop and that they are still searching for additional suspects. On Monday, investigators said they were searching for two suspects, at least one of whom shot at Onfroy during an "apparent robbery," before fleeing in a dark-colored SUV. In that statement, the sheriff's office also noted it would offer a $3,000 reward for information that led to an arrest. A statement from Onfroy's manager posted on social media on Tuesday, June 19 requested that the privacy of his family, friends and loved ones "be respected at this time." Onfroy's murder triggered an outpouring of tributes from his fans and other artists, with Kanye West writing that he never told Onfroy "how much you inspired me when you were here." In Los Angeles on Tuesday night, a vigil attended by around 1,000 devolved into the crowd jumping on a news van and swarming passing cars, according to the Los Angeles Times, before being dispersed by police. Earlier that day, a Broward television station reported that "hundreds" gathered at the site of his shooting in a vigil, leaving behind teddy bears and graffiti. But the response to Onfroy's death has been notably divided, due to the litany of allegations against him, including the battery of a pregnant ex-girlfriend and a history of other violent actions, as Onfroy recently described in an interview with Miami New Times. On Twitter, some thought he didn't deserve posthumous celebration because of that past. "If we act as if he never existed, or as if he was not as popular as he was ... or as if his fans didn't see some articulation of their own hurt and hopelessness in his music, we're lying to ourselves," The Ringer's Lindsay Zoladz wrote the day of his death. In the headline of a piece on responses to his death, The New York Times wondered: "Hero or Villain?" The day after his death, June 19, XXXTentacion's song "SAD!" was streamed 10.4 million times on Spotify, breaking the global single-day streaming record set by Taylor Swift on Aug. 25 of last year, the day that her single "Look What You Made Me Do" was released, with 10.1 million. As well, his album ? is expected to return to the top 10 of next week's Billboard 200 albums chart.